Happy Holidays to all of you. Over the past 13 months I have enjoyed writing these weekly (or so I try) entries. I have especially enjoyed receiving emails from you with ideas, questions, and kind comments. I hope I have provoked some interest in vintage fountain pens and in restoring them. It is not a mysterious science, and as many of you have discovered this year, it is quite rewarding. I hope to be able to add to these pages as we progress through another year. I encourage you to reread some of the previous 63 articles published over the past 13 months if you get a chance. As we are approaching Christmas Day, I thought I would repost pictures from my entry of Christmas Eve 2007. 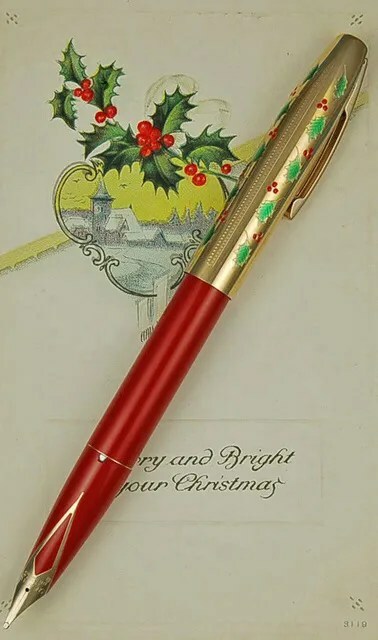 The pen is a Sheaffer Holly Pen, produced in 1996. From time to time, I mention that I run into other interesting related collectibles to fountain pens and occasionally post them. A distant tie-in are vintage post cards which often carry interesting messages from the past on the back, often written with fountain pens. Here is a sample from 1913, though the back has no message. 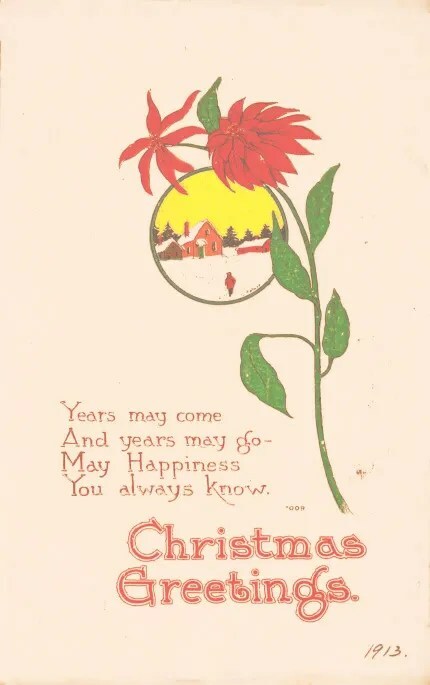 As in 1913, I wish all of you a Merry Christmas, Happy Holidays, and may you find happiness in the New Year. I have previously covered desk pen restoration in my posts of December 21, 2007 and January 19, 2008, titled Rube Goldberg Ink Delivery Machine and Fishing For A Desk Base. Both of those were Sheaffer Desk pens. 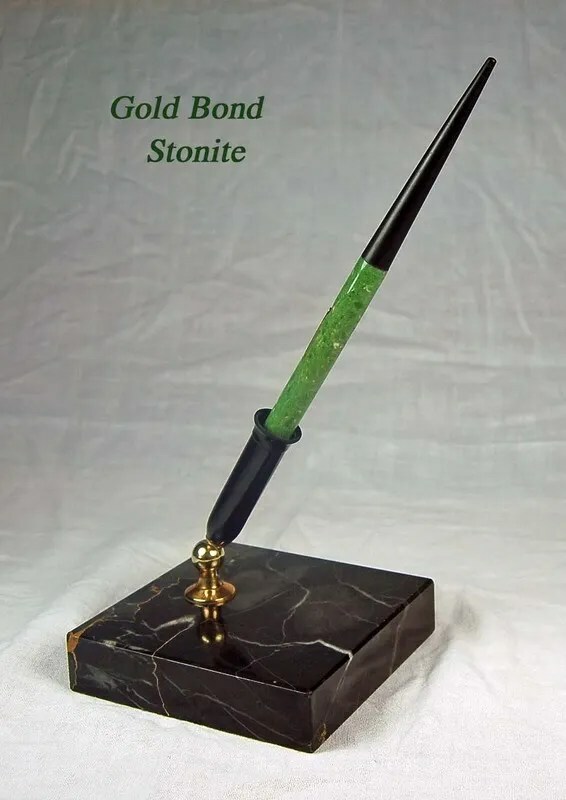 This week I worked on a Gold Bond Stonite Desk Pen. After taking the pen apart, a couple of items stand out. First, there is quite a bit of discoloration at the end of the barrel, where the section was seated. I am not certain what caused this, but suspect it was the hard rubber of the section bleeding into the plastic of the green barrel. There was no sign of an old sac or pressure bar inside the pen. This leads me to believe that someone had taken the pen apart at some point to attempt to clean or repair it. They may have just decided to use it as a dip pen as the nib and inside of the base were caked with ink. I, unfortunately, did not take a picture of the base before restoration, but the black marble material was quite clean. The “trumpet”, or black holder for the tip of the pen, was coated with dried blue ink. The gold swivel base between the trumpet and the base was tarnished and stained. I removed the section, which was friction fit, from the barrel and had a bit of trouble removing the nib and feed from the section. I finally soaked it in the ultrasonic cleaner for 3 minutes and then was able to knock it out. I cleaned these out and polished the nib. One thing to remember on desk pens – the feed needs to be thoroughly cleaned as it is often much dirtier and caked with ink than in a regular capped pen. 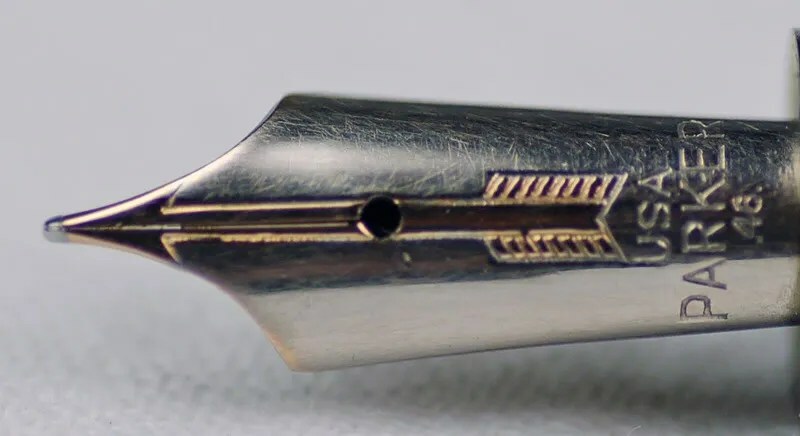 The nib and feed have often been sitting in the base for years and the ink has pooled in the base. This feed was a good example as the dried ink had filled all of the channels. So, I gave it a long swim in the cleaner and then used dental floss to clean out these channels. It worked surprisingly well and there was no risk of damaging the rubber. Thanks to my local dental hygienist! The barrel needed to be cleaned and I wanted to try and remove the stained area near the section as much as possible. The stain seemed to extend through the plastic, but I used a small piece of 1000 grit sandpaper to work on a 1/2 inch strip near the section end. After about 10 minutes of careful sanding, I polished the entire barrel using scratch remover, then polish, and them carnuba wax and a buffing wheel. The results were very good and the brown staining has disappeared. I needed to place a new j-bar into the barrel which is quite narrow. I had to bend the j part of the barrel inwards a bit to allow it to seat properly into the barrel and align with the lever. Then I attached a thin sac (size 15 1/2) to the section/feed/nib assembly. After allowing the sac cement to dry I reinserted it into the barrel. The base was the next project. As I mentioned, the black marble base was clean. It no longer had a felt cushion underneath to prevent it from scratching the desk, so I went out to the local craft store and purchase some green felt, cut it to the right size, and glued it to the bottom. Next, I polished the black trumpet and then the gold swivel. Special attention needs to be paid to the trumpet because, as with the feeds, they are often filled with caked on ink. This was no exception, and I sat it upside down in the ultrasonic cleaner (before attaching the felt) for a while to help dislodge more blue ink. Below is the finished product. Here is a close-up photo of the Warranted No. 4 Nib. I have seen Gold Bond pens with Gold Bond nibs and with Warranted Nibs. As I have mentioned in previous posts, Gold Bond Pens were produced in Chicago, probably by National Pen Products. They were marketed by Montgomery Ward Stores, both in stores and through catalogs. 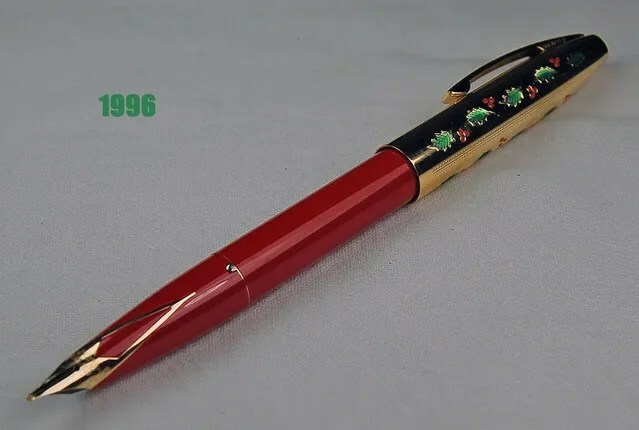 I do not know the exact year that this pen was produced, but given the green marble plastic and its popularity with other pens of the time (Parker Duofolds / Sheaffer Flat Tops ….) I would speculate it was sold in the late 1920s. I also do not know if the base is original to the pen. I purchase it with the pen, and the pen seats well in the trumpet, but the only way to be certain would be to see advertising from the period, which I have been unable to locate thus far. I will put this forward as a research project and add to this post at a later date should I find further information. I am not a desk pen user, except for a simple Esterbrook set on my workbench that I use to write in my repair journal, so I will probably not use this one. It will occupy a proud spot on top of my pen case however, as the green plastic really shines. This week I worked on a bit of an odd pen. It is a Vacumatic Standard Size (5 1/16 ” capped) with a date code of 1938. It is unusual because of the fact it has a lockdown filler and was produced in 1938. By that time, most of the Vacumatics were produced with metal speedline fillers (1937) and single cap bands. It is possible that the cap is a replacement, but the imprint and lockdown filler with its short blind cap are not replacements. So, I am guessing (this opens me up to debate for sure) that this is a very late first generation Vacumatic Standard, produced to use up existing stock. Whatever the history, these are my favorite of all Vacumatics as they are a thicker pen than the later Majors and have a matching, large section for easy handling when writing. They just seem more substantial in the hand than later medium sized models. You can see from the first picture below that the barrel had no transparency to it, but all the parts were present. Often times, when one finds an earlier Vacumatic, something is missing. The usual suspects are the clip or jewels. This was a complete specimen, though quite dirty. As usual, the old diaphragm took a long time to completely remove from the barrel. Once done, I scrubbed the inside of the barrel with a qtip (to prevent scoring of the barrel). This eventually revealed a nice transparecy. I polisehd the clip, nib, and silver clip and endcap jewel holders. The section, feed, and breather tube were cleaned in the ultrasonic cleaner. I buffed the barrel and cap with scratch remover, polish and carnuba wax which gives pens a new looking shine. Quite a difference from when I found this one. The lockdown filler unit takes a standard size diaphragm as do all Standard First Generation Vacs. This is due to the wider barrel which I really like in these pens. After reassembly, here is the completed pen. I tested it with water and the barrel filled up nicely. It measures just over 5 inches long capped. The nib is a two tone arrow nib, which was the upgraded nib for the first generation Vacumatics. The date code is for the 4th Quarter if 1936. After 1936 the USA/PARKER words were switched so that Parker appeared above USA. This photo shows the barrel and date code. The 18 signifies production in Janesville, Wisconsin in the first quarter of 1938. Interestingly, this was the last quarter that this coding system was used. During the second quarter of 1938, Parker phased in the dot system of date coding. This pen was seems to have been at the end of several runs ~ The First Generation Production / The USA over PARKER Nib / and The “dotless” numbered Date Codes. These first generation Vacumatics may not be as plentiful in the wild as later models, but are worth the wait. This week I worked on my first Parker Black Transparent Vacumatic. I have always enjoyed writing with vacumatics and restoring them, but have previously owned grey, blue, gold, and green models. This is the first black one I have acquired. I am glad that I did. Below, in the first photo, you can see the pen after I took it completely apart. Everything is in quite good condition here. The breather tube is clogged, which is easily handled by a quick soak in the ultrasonic cleaner. 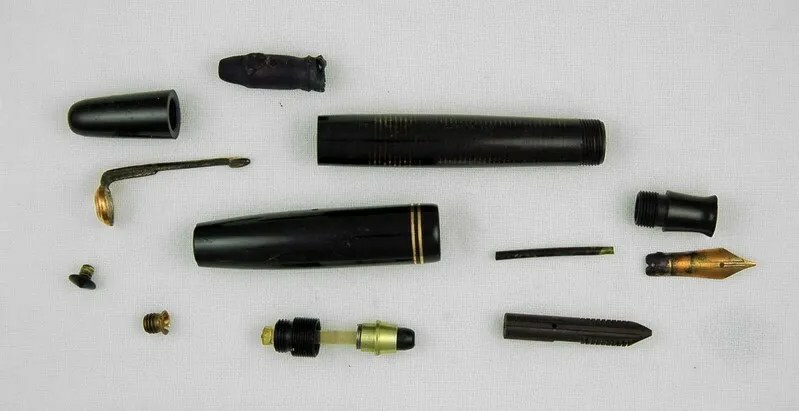 Someone had attempted to install a new diaphragm as it was very pliable and had had little use compared to the barrel and nib assembly which had a lot of old ink residue. The barrel had very little transparency and could almost be thought of as solid black plastic, as the cap is in this model. The diaphragm had been installed incorrectly as it had bunched up in the barrel, which could be seen when shining a light in the barrel after removing the section/feed/nib. So, the pen needed a thorough cleaning as well as a new debutante size diaphragm. I spent quite a bit of time gently cleaning the inside of this barrel. If one can get a transparent barrel on one of these pens, it is very stunning as it contrasts directly with the plain solid black barrel. Luckily I was able to get this one cleaned out completely so that there was little evidence of any residual ink. Be very careful to only use soft sided tools to clean the inside of the barrel (an ultrasonic cleaner is very useful here also) as you don’t want to scratch the barrel insides at all and ruin the transparent view. I used a debutante size diaphragm on this pen as it is a third generation junior, measuring 5 inches capped. The filler, as you can see, is a speedline filler and the cap is a non-blue dot third generation. The nib is a monotone gold arrow with a fine tip. After cleaning and installing a new diaphragm, the photos below shows the completed pen. It’s marking show that it was produced in Janesville, Wisconsin in the 3rd Quarter of 1946. As I have mentioned before, Vacumatics were produced by Parker in the US from 1933 to 1948, so this was near the end of the production run for this popular pen. My favorite part of this particular finish (Black Transparent) is the contrast between the solid black cap and the barrel. Barrel transparency is always a highlight with these restored pens, but it never stands out as clearly as with this finish. Finally, sometimes it is fun to play around with Photo Shop on pens. Here is a “textured” redo. I will add a few of these from time to time, as my kids think it is far more interesting than pen history!